Called in at Bewdley, Ivatts doing the business again today & 7802 on a dining charter. An 08 was shunting the yard & the repainted DMU car was in platform 3. 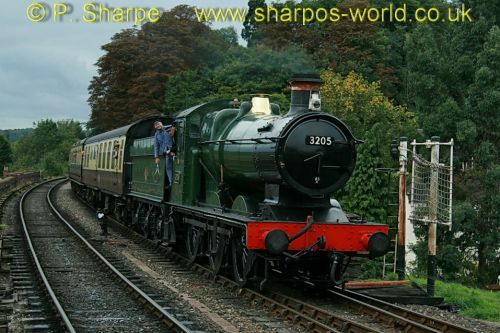 This entry was posted in Severn Valley Railway on September 30, 2010 by Sharpo. To the Engine House for lunch, Ivatts in charge again – 43106 was on our train both ways & 46443 on the other. Just a brief visit, 43106 to Arley & 46443 back to Bewdley. 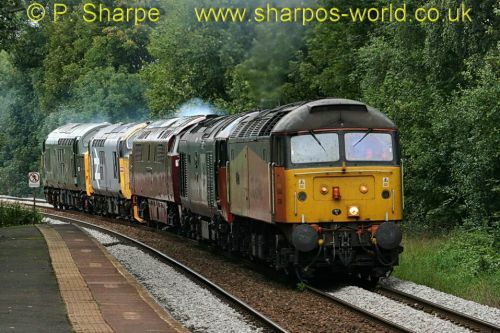 This entry was posted in Severn Valley Railway on September 28, 2010 by Sharpo. Finished uploading the photos from Friday, dull weather all day, so no shots in sunlight. Still, you can see how it was on the day The latest photos were taken at Bewdley & Highley and are on the same link as the previous update, just skip through the ones taken at Kidderminster. This entry was posted in Sharpo's World Photo Updates on September 27, 2010 by Sharpo. Only the photos taken at Kidderminster have been uploaded so far, the others will follow in a day or so. Weather was cold, dull & wet, which didn’t help, so not the best of photos. An earlier posting gave details of my day, so I won’t repeat it here. This entry was posted in Sharpo's World Photo Updates on September 26, 2010 by Sharpo. We spent a few hours at Kingsbury Water Park during the day watching the locos running on the 7¼” gauge railway. Good variety of locos in action and the first time I have seen trains running on the extension to Far Leys. Fortunately the weather was dry, with plenty of sunshine and we even had a ride on one of the trains. Lots of photos to sort, give me a few days! This entry was posted in "Other" railways on September 25, 2010 by Sharpo. A cold & damp start to the gala. I was at Kidderminster in time to see the first departure – 5690, backwards, as were the next two departures. Manston was on the 4th train & chimney first (not that you can see the chimney!) I travelled to Bewdley behind 5764 and noticed that the next train for Kidderminster was double-headed Manors, so got off for some photos. 4566 followed 5764 with the freight before the Manors could leave. 3205 was the next arrival from the north, then Truro from Kidderminster, which had to wait for Leander from the north. Truro then took me to Highley where the following were seen – 5542, 7802, 3205, 34070, 5164, 3717, 5690 and then back to Bewdley with 7802, just in time to see 5764 double-head with Truro. Soon after the double-headed manors departed, 3205 arrived & took me back to Kidderminster. A cold but enjoyable day, oh, I missed the flask train – through Kidderminster at about 16.10, a 37 & 66 which was rather unusual! Plenty of photos to sort, not too bad considering the weather conditions – I’ll upload them in a day or so. 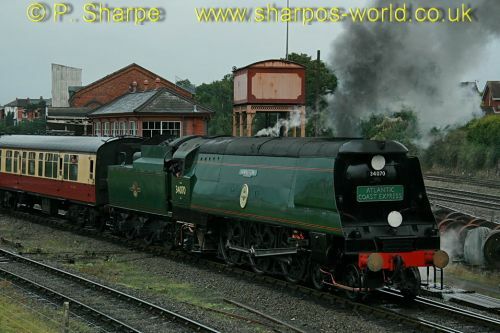 This entry was posted in Severn Valley Railway on September 25, 2010 by Sharpo. Following on from the posting earlier today, the convoy of the above locos passing through Old Hill on the way to the Nene Valley Railway have now been uploaded. This entry was posted in Sharpo's World Photo Updates on September 23, 2010 by Sharpo. I saw the convoy at Old Hill today, heading towards the Nene Valley Railway for a gala. The 37s would also appear at the Mid Norfolk Railway gala this weekend. Took some photos & will sort them later. This entry was posted in Main line on September 23, 2010 by Sharpo. This entry was posted in Sharpo's World Photo Updates on September 22, 2010 by Sharpo. Had a week in Cornwall, that’s why no posts recently. It’s never a good idea to let people know you’re away from home, but if you wondered why there were no postings, that was the reason. A few items of railway interest – saw “Lyd” at the Launceston Railway on the Thursday, in steam but not working trains, Hunslet “Covertcoat” was on our train. On Friday I managed to make a detour to see 6435 on the Bodmin Railway. Saturday found us heading for Okehampton for a ride on DEMU 1132 to Merldon Quarry. Sunday was the “big one”, lunch at Looe gave me a chance to see 37685 & 9466 top & tail some specials on the branch, then to Bodmin Parkway to see 6435 & 30587, finally 60019 “Bittern” on “The Cornishman” returning to Bristol. 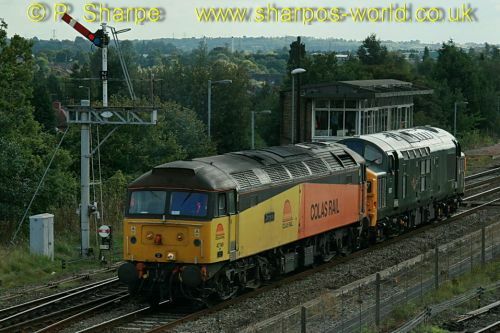 This entry was posted in "Other" railways on September 22, 2010 by Sharpo. Arley for sandwiches today, first train seen was 4566 s/b and then 7812 n/b. Up at the station 46443 on the LMS set was on Footplate experience & D821 on the diesel turn. Just before we left, 4566 was heading north & 5164 coming the other way. I did read an e-group posting that 43106 took the place of 4566 later in the day, but didn’t see that loco. This entry was posted in Severn Valley Railway on September 11, 2010 by Sharpo.